Bjørn Frantzen has co-authored a book detailing where to spot the hundreds of bird spices in Varanger and Murmansk regions. The Norwegian-Russian borderland along the coast of the Barents Sea and White Sea is full of pristine locations with unique bird life. However, where to access and what to see has not always easy to know. Especially on the Russian side of the border. “Birding across the borders” is written by four of the most knowledgeable ornithologists in the Barents Region. The book provides the first comprehensive guide to sites in both the Varanger area and on the Kola Peninsula. Bjørn Frantzen works for the Norwegian Institute of Bioeconomy Research’s location at Svanhovd in the Pasvik valley, a knowhow hub for cross-border environmental research. He has co-authored the book together with Morten Günther, Eugene Potorochin and Yuliya Solnetseva. Birding, or birdwatching, is a fast growing out-door activity world-wide with tens of millions of people engaged. 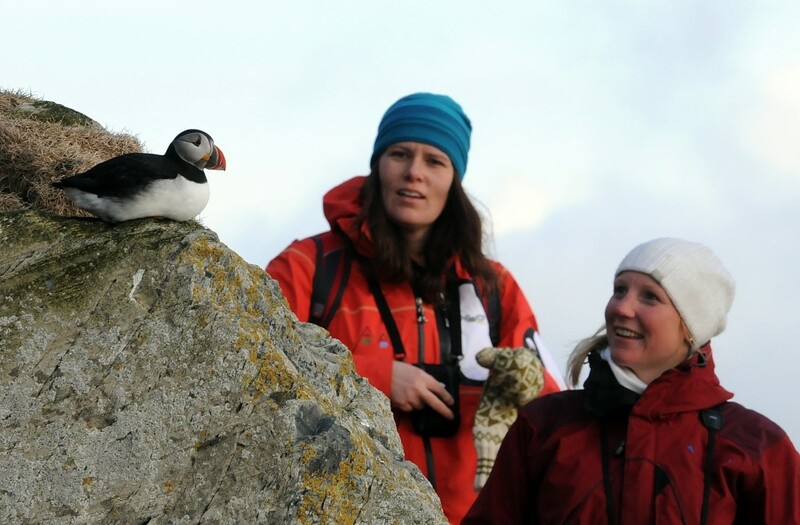 On the Norwegian side of the border, Varanger is already famous for spectacular seabird spots. Bird tourism have only recently made its way into the north coast of Russia, and the new book is the first in English to provide an overview of accessible birdwatching locations. “Most interesting and suitable locations for Norwegians to come birdwatching are near the city of Kandalakhsa and along the Tersky coast,” says Eugene Potorochin. In the borderland, Bjørn Frantzen explains, you find spices like king eider, glaucous gull and Brünnich’s guillemot that have their southern boundary along the coast of Finnmark and the Kola Peninsula. Other spices, like the smew, little bunting and Arctic warbler are wintering in Southeast Asia and are found few other places in Europe than in the Norwegian-Russian border land. One popular eider for visitors to spot is the colorful Steller’s eider. It winters in the ice-free waters along the coast of Varanger and Kola and migrates for nesting in summer to Yamal Peninsula and Taimyr Peninsula in northern Siberia. 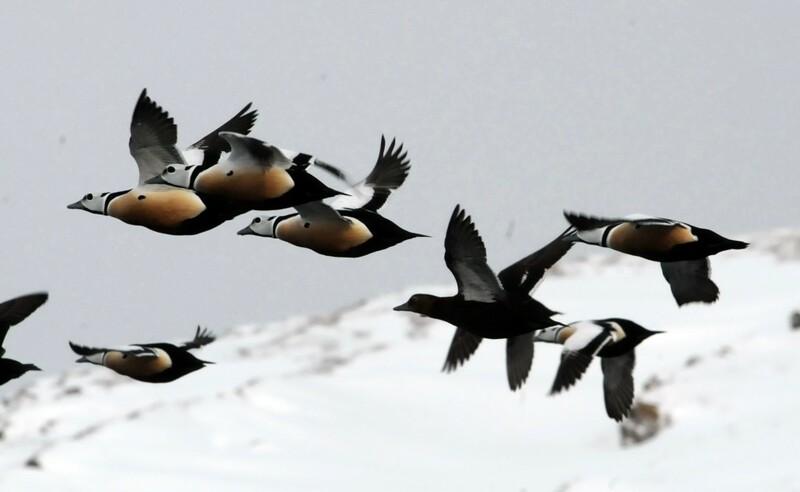 “If you want to see the Steller’s eider, Varanger is better than the Russian side of the border, since the north coast of the Kola Peninsula has strict border zone regulations making it difficult for tourists to access,” Frantzen informs. Located a stone’s throw from the border, Svanhovd’s environmental cooperation with Northwest Russia has been going on for more than 25 years. Svanhov is not only located on-the-border, but also where the Russian taiga forest meets the West European fauna. Birdwatchers from around the world are travelling to the Pasvik valley because here they can see species not found at other locations in Western Europe. Here, some extremely rare bird species like Ruddy Shelduck, Long-billed Dowitcher, Pacific Golden Plover and Red-rumped Swallow are spotted from time to time. Traditionally there have been very few amateur birdwatchers in Russia. Mainly scientists were concerned with ornithology, and in the north most of them were employed in the federal nature reserves, like Pasvik Zapovednik, Kandalaksha zapovednik, or Laplandia zapovednik; all in the Murmansk region. Bjørn Frantzen and his colleagues have some favorite locations. “The inner larger marshlands and eastern parts of the Kola Peninsula where there are no roads. This is pristine wilderness way more inaccessible than any Norwegian areas,” he says and points to several Russian tour operators specializing on such exclusive expeditions. In total, the book guides you to 49 possible areas of worth visiting, including bird-cliffs along the coast, fjords, rivers, marshlands and lakes. Detailed maps, photos and local regulations are added to the comprehensive descriptions of the different locations. Although, the guide’s main focus is bird-sites, it also gives you practical tips and basic information on how to travel and find accommodations in the borderland. “The book is a contribution to the Russian-Norwegian environmental cooperation aimed at making it easier for tourists who wants to see birds to find good locations. Also, we hope to facilitate for an increase in nature-based tourism on the Russian side,” says Bjørn Frantzen.